The convenience of shopping online has left many of us wondering why we ever subjected ourselves to the hassle found with going to the store. Getting what you want, when you want it, all at the click of a button has changed the way consumers shop. Consumers can shop for almost anything online including fencing. In fact, now-a-days purchasing a fence the old fashion way may even be harder than it is online. Not only do you not have to leave the comfort of your own home, online fencing companies are offering additional services to ease the process from the initial planning to the final installation. As with any online purchase it is important to understand the process involved with getting exactly what you want. If you have not chosen a type of fencing your first step is to figure out what you want. Many online fencing companies will send free fence samples to allow customers the chance to see and feel exactly what they are buying. With fencing you get to sample different grades and colors, so you can feel the weight and see the color; this way you know exactly what you are getting and aren’t surprised when your order arrives. A popular preference for homeowners is aluminum as previously mentioned. 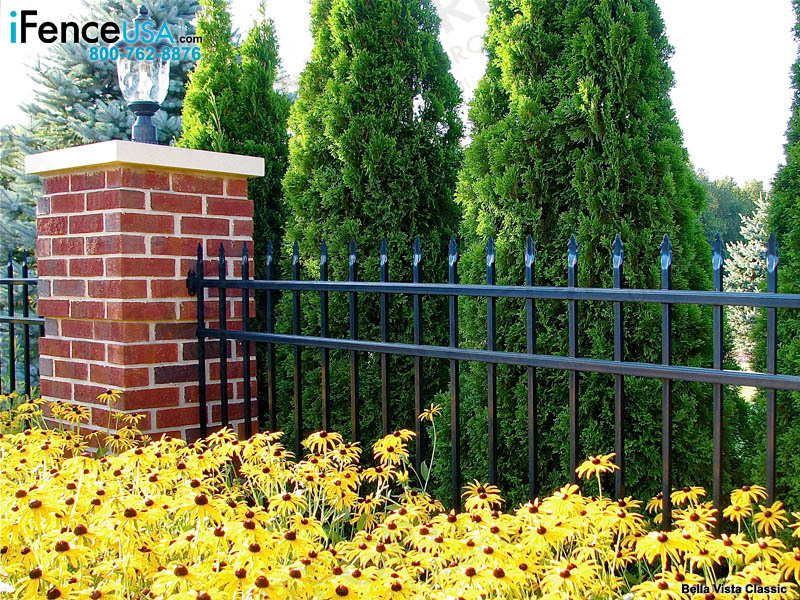 Black aluminum fencing being the most sought-after material and color. If you don’t have any idea of what you want it is a good idea to get samples of several different materials, colors, and grades from online fencing manufacturers. The visual element of a sample can really help solidify your choice. Another matter that is important when ordering a fence online is that homeowners order exactly what they need for their space, not more, not less. When you are in the planning phase it is crucial to get an exact measurement of the yard perimeter where the fence will be installed. This measurement, along with a detailed sketch can be sent to online fencing specialists to help them assess your need as well. Double and triple checking measurements prior to placing your online fence order will save you time, money, and a whole lot of aggravation. Once homeowners have an idea of how much fence is needed (total linear footage) they will divide that by the length of the aluminum fence panels, most common sizes being 6- and 8-foot sections. Some homeowners will need to customize some of the fencing panels as adjustments are needed for landscaping but overall most of the fence panels either 6- or 8- feet. How many years has the company been in business online? Read online reviews and look into customer feedback. Review their shipping and delivery terms and fees. Unlike traditional wood gates and fences, aluminum fences and gate do not need regular maintenance. However, to preserve the beauty and to ensure the prolonged existence of your aluminum fencing and aluminum gates, an annual schedule for maintenance should be planned. Spray your aluminum fencing regularly with water using your garden hose. This helps to eradicate fertilizer chemicals, dirt, and grass clippings thus, keeping it looking as good as new. In coastal areas, frequent spraying of your aluminum fence panels with water is advised to reduce the buildup of dirt and salt. Rinse your aluminum fencing with water from top to bottom and then back up. This cleans the surface and prevents streaking as well as the gathering of dirty “run-down”. After rinsing, wipe the fence with a lint-free, soft cloth or better still, air dry. For more filthy parts of your fence, first rinse the surface of the aluminum fencing with clean water and then wash with a sponge and mild dish soap mixed with water. Make sure not to allow soap to collect on the surface and, rinse any “run-down” immediately. Once washing is done, rinse the whole section with water. Dish soap must not dry on the surface! Air dry or wipe with lint-free, soft cloth. Carry out these steps repeatedly to get rid of water soluble debris. Degreasers and cleaners can also help with stain removal especially for stubborn stains. Simple stains can be cleaned by applying a degreaser which must be rinsed after applying. For stubborn or hard water stains, cleaner such as CLS. It can come in handy to remove stains. It should also be rinsed after use. However, adequate care should be taken when making use cleaning products for your aluminum fence as some abrasive agents, household cleaners, steel wool or cleaners with solvents contain harsh chemicals which could cause discoloration and damage to your fence. Adjust the aluminum fencing panels every spring. This is a normal maintenance activity that must be performed by the homeowner. Always keep your aluminum gate secured to prevent it from swinging in the wind. Make sure to tighten the screws on your aluminum posts and panels at least once a year. Carry out frequent inspections to check for any loose aluminum fence post and once you find any, simply re-tamp & realign. Avoid mounting or stacking any materials or objects beside your fence. No longer are dreams of white picket fences but instead dreams of low maintenance, durability, and curb appeal. Homeowners can get this through the installation of aluminum fencing as it brings with it a more current feel than is found in other materials. Another benefit found with the purchase and installation of aluminum fencing is the ability to design it yourself. Each detail of your aluminum fence can be customized to compliment your home. Aluminum fencing offers several benefits to homeowners. Its durability can make a 20-year-old aluminum fence look like it was just installed; aluminum fences sleek designs ensure a look that will compliment every style home. Literally every detailed from the color of the aluminum to the decorative style of your fence can be designed to meet your exact needs and show off your unique home. Fence Heights: One of the most important jobs your homes fence has is to accomplish the purpose it is there to serve. From guarding the swimming pool’s perimeter to defining backyard boundaries if the fence doesn’t serve its purpose it is useless no matter how stunning it is. This is one of the reasons the height of your aluminum fence is an important consideration as you begin planning for your new fence. Fence Grades: When purchasing an aluminum fence, you have several options when it comes to the grade of fencing you choose. Residential and commercial aluminum fencing comes in 4 distinct grades including: classic (residential), resort (pool), premier (commercial), and ultimate (industrial). The grade of the fence that you choose will depend on the strength and thickness of the fence desired, the picket size, and length of aluminum fence panels desired. Fence Styles: There are eighteen different styles of fencing through online aluminum fence supplier iFenceUSA. For a more contemporary appeal you have the option of a three-rail design without pickets or a for a more exquisite look you can try something with Excelsior finial peaks which offer a timeless look; with iFenceUSA you have several ornamental aluminum fencing styles to choose from. Fence Colors: Aluminum fencing comes in a variety of unique color options. Classic black is always a favorite but rest assured that if you are looking to add character and appeal with color, aluminum fencing has you covered. Options include several matte and gloss varieties of white, bronze, green, beige, sandstone, and black. 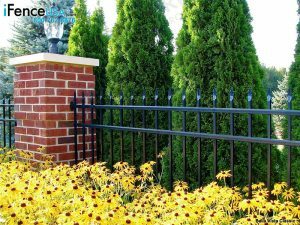 Fence Options: Some of the most popular options in aluminum fence relate to the spacing of the aluminum pickets, the addition of bottom railings, special post caps, and more. The options that you choose will depend on your unique goals. For home owners with small dogs, puppy pickets may be ideal whereas people with small children may choose extreme pickets that feature pickets that are closer together to prevent easy climbing. iFenceUSA is an online manufacturer and distributor of wholesale aluminum fencing. With over 18 styles of aluminum fence panels and gates to choose from, we have aluminum fences that will meet your wants and need. 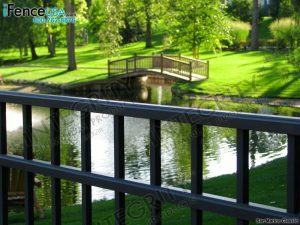 Choose from custom aluminum fencing options including: Commercial Grade Aluminum Fencing, Residential Grade Aluminum Fencing, Pool Grade Aluminum Fencing, and Industrial Aluminum Fencing all at https://ifenceusa.com/. For more information contact one of our aluminum fence experts toll free 800.762.2907 or via email at info@ifenceusa.com. Many people seem to think that they can choose any type of fencing for their yard and it will instantly match their home and improve their curb appeal. However, that is not always the case, because some housing styles look better with specific fencing options over others. That means that you will need to do a little research before purchasing the fencing that you have had your heart set on for years, because it won’t do you any good to purchase your dream fencing to only have it decrease the value of your home. Aluminum fences are available in many different styles and colors, so that material is going to be your best option when you are shopping for a fence. A few of the different styles that aluminum fencing is available in include two or three rails, arches, pickets, finials, and even flat tops. A lightweight style can provide amazing curb appeal, but you may prefer the conventional wrought iron designs that will allow you to place the picket points wherever you want. Many homeowners prefer pickets that are placed in a uniform order, but that doesn’t mean that you need to do the same type of installation on your property. Instead, your aluminum fencing can have staggered pickets or even smooth surrounded pickets. If you do not like the idea of pickets sticking upright, we recommend choosing an aluminum fencing that has a top rail over the pickets. That top rail will keep everyone safe while also keeping your aluminum fence looking streamlined and beautiful. You may also want to consider adding accessories like ball caps, scrolls, or even finials to your aluminum fencing to add a unique feature that will make it stand out from the rest of the fencing in your neighborhood. Many aluminum fences that are installed are black however, that doesn’t mean you cannot choose to install aluminum fencing in a color. Of course, you will want to make sure that those colors will match the current style of your home. The best part of aluminum fencing is that once you choose your preferred style and color, you can also choose the height that will meet your needs. A shorter fence can be used around your property if desired, while a taller fence always works better around swimming pools. You will want to look at many different types of aluminum fences before choosing the one that you want to install around your home, as your first choice is not always your best option. Most homeowners realize that having fencing around their property is necessary for a number of reasons. Whether it is to contain family pets, provide a safe place for the kids to play and to maintain a physical separation between neighboring property. When it comes to fencing there are many different options to choose from, but there really is only one that has the ability to raise the value of your home and property, aluminum fencing. There are no worries about your fencing ever becoming unsightly over time like iron fencing. Aluminum will not rust, unlike traditional iron fencing that will over time begin to rust. It will also never rot unlike fences made from treated wood. Aluminum fencing is a much cheaper alternative to wrought iron when it comes to decorative fencing. When you consider the cost-effectiveness of purchasing wholesale aluminum fence panels, posts, and gates over the those made from wrought iron, you are likely to make the right decision. Aluminum fencing is one of the more versatile of the many types of decorative style fencing. It can be found in a number of different types of finishes, colors, and styles. There really is no worries about whether or not the final result will look gaudy or cheap. It can even increase the overall curb appeal of your home and property, which in turn will help to add to the value of your property. Today’s aluminum fencing can be manufactured in a number of different styles in order to be able to fit in with a wide range of landscaping and terrain. It also can be tailored to fit in with a wider range of changes in elevation due to the material that is used to construct it. There is far less likely that there will be unacceptable gaps between the ground and the bottom of the fence. While both wooden fencing and chain link fencing each have their own pluses and minuses when it comes to security. Neither one can provide a high level of security and still look amazingly good. Aluminum fencing is made using the highest quality materials and processes that result in the most beautiful looking fence that will quite possibly outlast the house it surrounds.